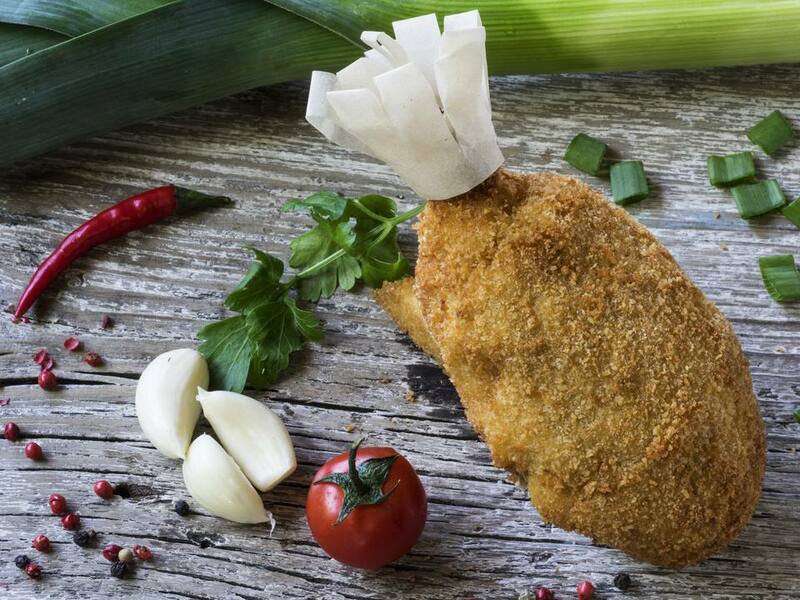 The Poles say chicken kiev, kotlet kurczeta, originated in the Polish city of Kijow, while the French say it was invented by Nicolas Francois Appert in the 18th century and adopted by Empress Elizabeth Petrovna (1741–1762) of Russia who preferred French foods and fashions. It is also thought early New York restaurants trying to please the many Russian immigrants gave it the moniker "kiev" which, in turn, was taken back to Europe and adopted there. Whoever invented it deserves a medal of honor. Breaded chicken and pork cutlets are common main course offerings in Polish homes. Remove fat and any cartilage from chicken breasts. Pound each to 1/4-inch thickness between two pieces of plastic wrap. Season both sides with salt and pepper. Place 1 piece butter in center of each breast and roll as for an egg roll or burrito. At this point, the breasts can be placed in the freezer for 30 minutes to ensure the butter becomes firm again and won't leak out in the cooking process. Dredge breasts in flour, then egg wash and then in breadcrumbs. Repeat, double breading the cutlets. Let them dry for 10 minutes before frying. Heat 1 inch of canola oil in large skillet over medium-low heat. Slowly fry cutlets on all sides, for a total of about 15-20 minutes. Remove from pan, drain on paper towels and serve. Be careful when you cut into these, the butter will squirt out!